For her second form, see Queen Ariad. For the Agent, see Ariad (Agent). Ariad is a lieutenant in the Labyrinth of Ruin expansion. A vile, deeply clever sorceress, Ariad will stop at nothing to bring total darkness to the world and its people. Though her motivations are unclear, she remains a dangerous foe not to be underestimated. Ariad appears as the primary antagonist in the Labyrinth of Ruin campaign. 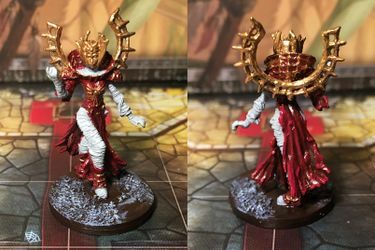 The Ariad Lieutenant Pack includes Ariad's miniature, and focuses on deceiving the heroes with illusions as well as granting bonuses to monsters with the cursed trait. Cursed Blast: Perform an attack targeting each Cursed hero in Ariad's line of sight. If insufficient range is rolled for any one target, the entire attack is considered a miss. Ariad's name is erroneously called "Ariadne" on the box of Labyrinth of Ruin. This suggests that she was originally named for Ariadne, a figure from Greek mythology associated with labyrinths and mazes.